When you’re planning Facebook ads, you need to think about the content, images, budget, targeting and more. 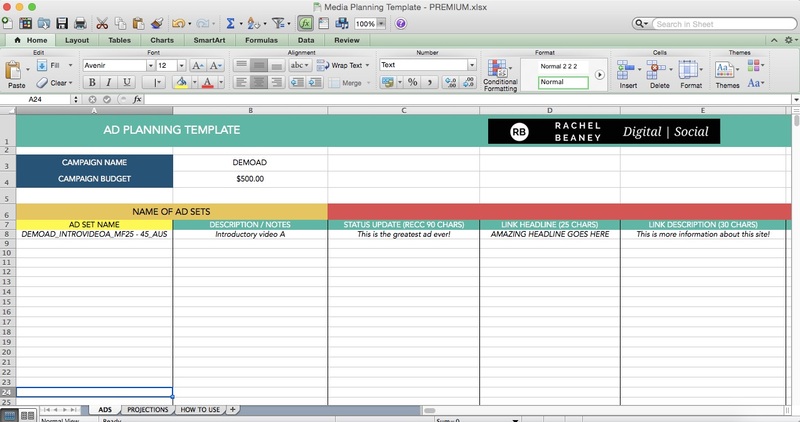 This Ad Planning Spreadsheet makes it easy to prepare your Facebook ad media spend before you jump into Business Manager. This Excel spreadsheet is designed to help you plan your Facebook ads, with colour coded fields to keep you plan every aspect of your content, ad targeting, spend, and timings. This spreadsheet also auto calculates your daily ad spend once the dates of your ad run have been included As a bonus, the spreadsheet’s second tab can project what your ad spend results might be, based on industry benchmarks, which you can update with your actual data as needed. 1 x Excel Spreadsheet download. After you place your order, you will be sent an email with a link to download the document. It may go to your junk mail, so please check carefully!